Many companies use a credit card for paying part or all of their bills. This section summarizes how to handle this in Control when you are using full accounting. Simple. Bills paid with credit cards are not directly entered into Control. When the credit card arrives, the credit card bill is entered and all expenses recorded at that time. Detailed. Bills are entered as normal and then paid with the credit card in Control. When the bill comes, the credit cards statement must be reconciled and the credit card bill paid. The simple credit card tracking system does not track the credit card explicitly, but instead treats all credit card purchases as being purchased from the credit card vendor. Given this, just treat the card provider as you would any other vendor. This is commonly used by smaller businesses that don't need detailed vendor tracking. Do not enter any bills paid with credit cards. Choose “Part” if the purchase was for a part in the system, otherwise choose “Expense”. Charge each item to the appropriate expense account. Enter as much information in the description as desired. Enter the credit card provider as the vendor. Pay the credit card bill as you would any other bill. The first step in the detailed tracking plan is to set up your credit card expense account. This will also create the option for paying by credit card. Following that, you will need to enter your bills normally (whether paid by credit card or not) and pay them with the credit card (when applicable). Finally, you will need to reconcile your credit card statement when it arrives to ensure you have captured all the charges appropriately. Choose the Chart of Accounts in the left menu. Select and then expand the Liabilities group in your chart of accounts. You can put the credit card account anywhere under the Liabilities section. With the group selected that you want to add the account under, click on the Add button above the chart of accounts. This will add a new GL Account. Classification Type - Choose Credit Card Account. Default Vendor for Bills - If you have already set up the credit card provider as a vendor, select this company now. If not, it is a good idea (though not required) to set it up at this time. Save the new credit card account. This will now show up on Bill Payment Methods automatically. Move the account up or down in the GL Account list by clicking on the “Move Up” or “Move Down” buttons if desired. Once the credit card account is established, you will need to set up a bill payment method so that you can now pay from this card. Click on Bill Payment Methods. 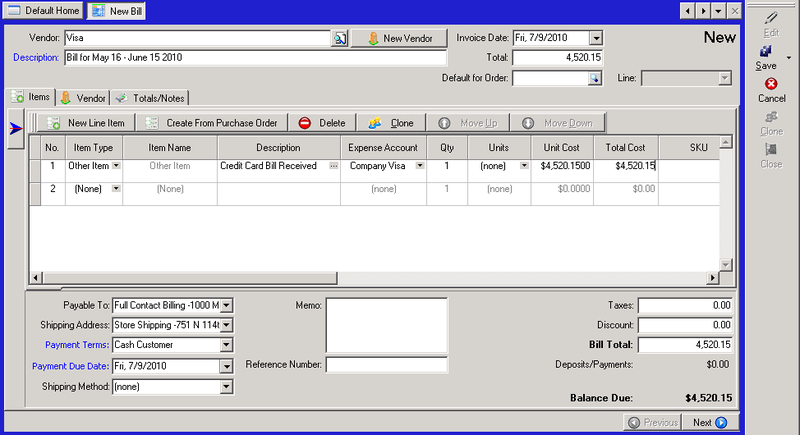 Click New on the Action Toolbar (on the right) to create a new bill payment method. Text - Enter the name, usually the same as the credit card name. Payment Account - Select the GL Account you just created. You may need to restart Control in order for this account to be selected if the account was just created. Credit Card Type - Select the appropriate credit card type for this account. Save the bill payment method. Whether a bill is paid by credit card, bank check, or other mechanism doesn't affect how it is entered. Enter the bill as you normally would, expense or accrue the costs as appropriate. To pay using the credit card, the process is the same as when paying by check (except for the printing and mailing!). Click on Banking | Pay Bills. Under the Payment Type (near the bottom of the screen), select the Bill Payment Method you created above. Select the Bills you want to pay with credit card just as normal. Click the Pay button on the Action Toolbar (right side) to mark these bills as paid. **Note:** When you pay a bill with the credit card, the GL effect is to transfer the balance from Accounts Payable to the credit card liability account. Once a month, most users received a statement from their credit card companies. If you have posted all of the bills, you will need to pay and reconcile the statement. Click on Banking | Reconcile Bank Statement. Select the credit card from the Account drop down. This may take a moment to load, but will then display all credit card charges and payments made that have not previously reconciled. Enter the date of the statement. Enter the ending balance from the statement. This will allow Control to track when you have successfully reconciled. Select all of the credit card charges from the statement. If there are charges not found in Control, enter those at this time. You can create one Bill for all items not found, or create multiple bills depending on your tracking preference. Select all of the credit card payments from the statement. The Difference field at the bottom of the screen must say “Balanced” when you are done. Enter any service charges and select the appropriate Expense Account for those charges. Click Post to mark the credit card as reconciled. If you need to postpone your actions, you can click Save As Postponed in which case when you re-enter this screen your selected items will be remembered. Clicking Cancel closes the screen and forgets all of your selected items. Paying your credit card bill is straight forward, but not always obvious initially. The balance of the amount paid with the credit card sits in the credit card GL Account. The first step is to create a bill for this amount to transfer it to Accounts Payable. The second step is to then pay that bill. When you receive your monthly credit card bill, create a new bill for the new charges accrued. Set the vendor to the credit card company. On the first line item, select “Other Item” as the Item Type. Enter “Credit Card Bill Received” or similar for the description. Important! Select the credit card GL Account as the expense account for this line. Enter the total new charges on the bill. Click Save | Save as Bill on the action toolbar (on the right) to save the bill. This will transfer the balance due from the credit card account to the Accounts Payable.